The S&P 500 experienced a waterfall decline in December, something rarely seen. 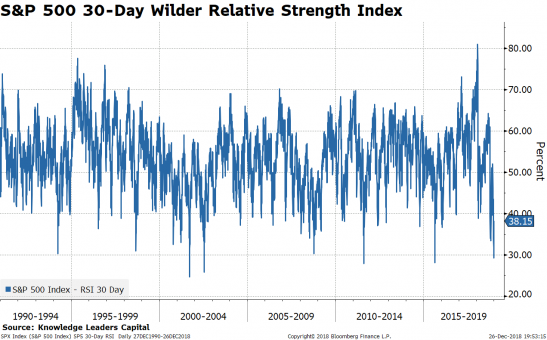 Measuring the decline using a 30-day Wilder Relative Strength Index, it is clear the extremes recently experienced. On Christmas Eve, the S&P 500 punctured 30% on the RSI, something that has only happened several times in since 1990. Similar extreme readings were seen at important intermediate lows (2001-2002, 2008, 2011 and 2015). 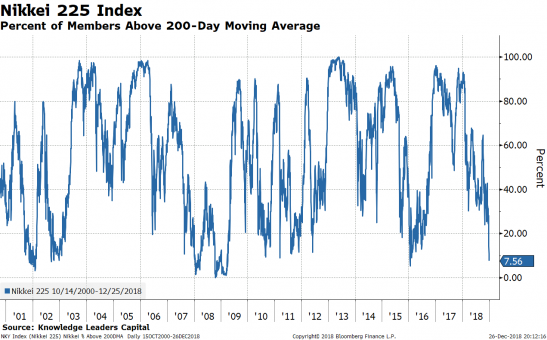 We also can assess the recent oversold condition by measuring the percent of stocks trading above their 200-day moving average. A reading below 20% is consistent with a significant liquidation. Readings below 20% were experienced in 1990, 1998, 2001-2002, 2008-2009, 2011 and 2015. On Christmas Eve, only 17% of stocks were trading above their 200-day moving average, down from 82% just three months earlier. 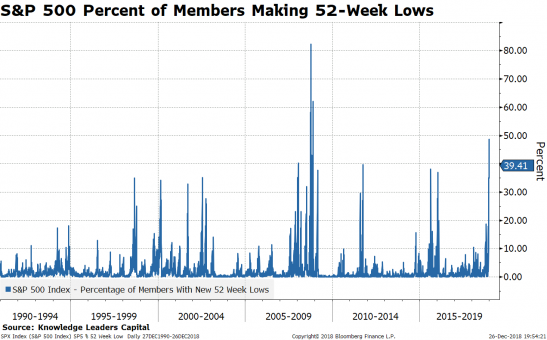 Measuring the percent of stocks making new 52-week lows is another tool we employ to measure oversold extremes in stocks. 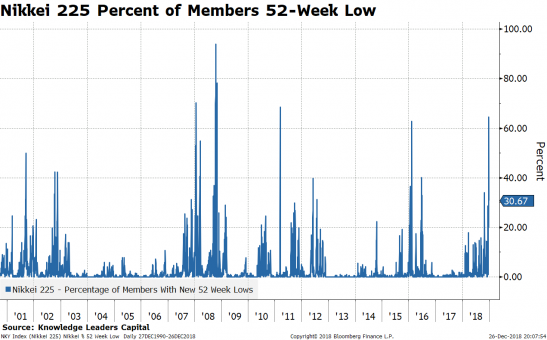 On Christmas Eve, over 49% of S&P 500 stocks were making new 52-week lows, a figure only eclipsed by the period immediately following the failure of Lehman Brothers in the autumn of 2008. 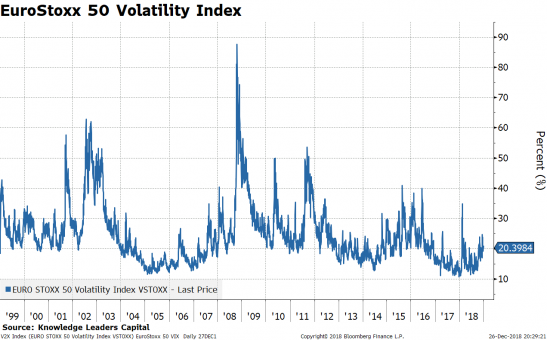 An additional piece of the puzzle when identifying oversold conditions is extreme readings in volatility. Generally, when investors panic, they pay up for insurance on further declines. Imagine if one had the prescience to know when one was going to get into a car wreck. One would increase coverage, paying a higher premium, in anticipation of the crash. 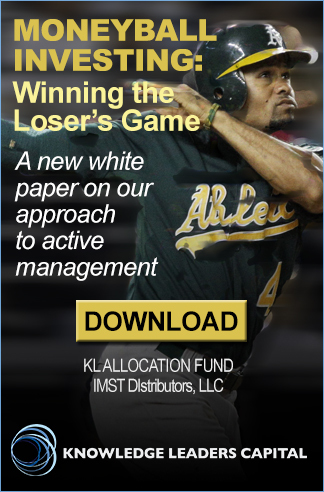 Insuring stock portfolios works somewhat the same way. As momentum gets rolling on the downside, signaling an increasing probability of a crash, investors that buy insurance to manage risk, pay up for downside protection. The VIX measures this scramble to buy insurance at ever higher prices. On Christmas Eve the VIX eclipsed 35%, a historically elevated level. 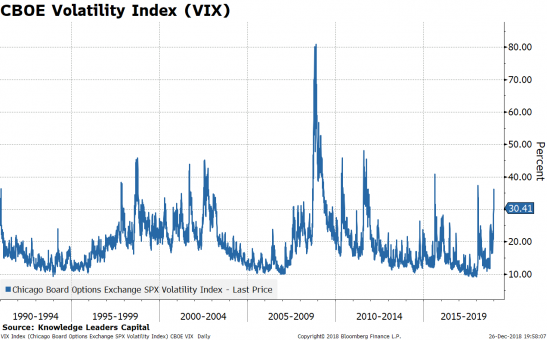 VIX spikes above 35 were seen at important equity lows in 1990, 1998, 2001-2002, 2008, 2010, 2011, 2015 and 2018. 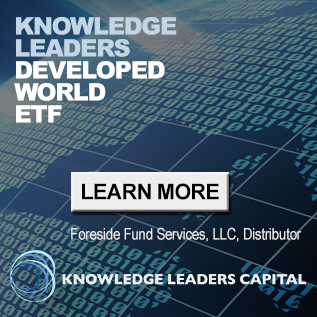 Identifying oversold conditions is crucial since one of the oldest dictums in the investment industry is entry points matter. We appear to have just experienced a significant statistically oversold extreme in US stocks, i.e. a great entry spot. Generally, market corrections produce cheaper valuations, which offer an investor a chance to buy into discounted assets thereby improving his or her future returns. While current valuations are clearly not as low as the once-in-a-generation lows we experienced in 2008-2009, they are 30% lower than the start of the year. 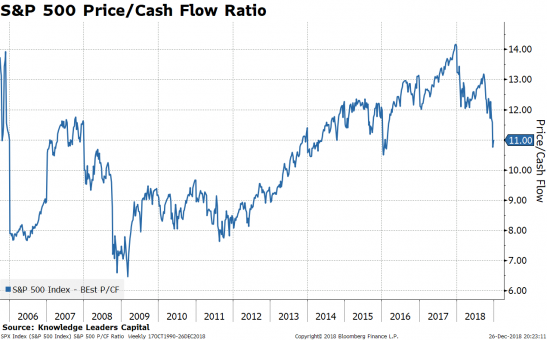 The 30% drop in the S&P 500’s price/cash flow ratio is larger than anything experienced since the start of the current bull market which started March 9, 2009. The S&P 500 price/cash flow ratio is back to where it was at the end of 2013. Foreign stocks have recently experienced similar waterfall declines and have generated significant oversold conditions as well. 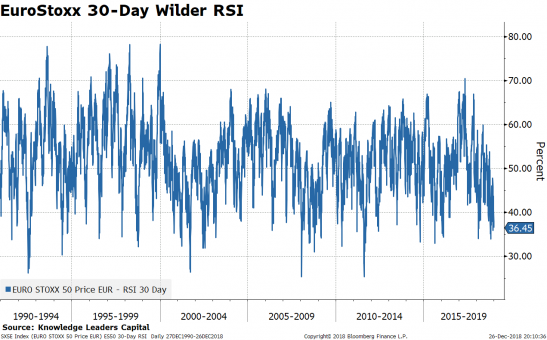 The Nikkei 225 Index didn’t quite reach the 30% threshold on the Wilder RSI, but it came close, hitting 33% on Christmas Eve. 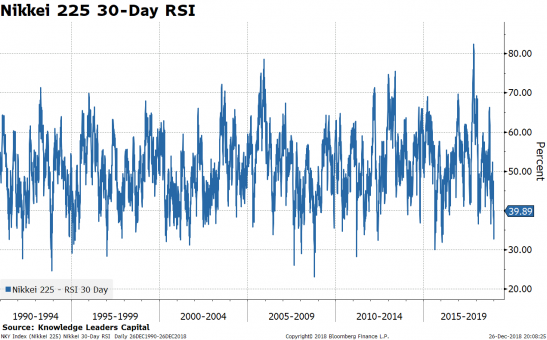 While the Nikkei 225 didn’t generate as low an RSI reading as the S&P 500 recently, it has exhibited other oversold characteristics more extreme than the S&P 500. On Christmas Eve, the Nikkei 225 saw 63% of its members reach new 52-week lows, about 10% more than the S&P 500. Here again, current readings challenge the most extreme oversold readings seen in the last couple decades. 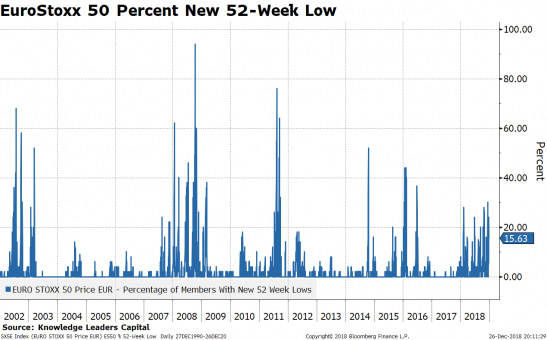 The percent of Nikkei 225 members at new 52-week lows eclipsed 60% only four times since 2000 (2008-2009, 2011 and 2015). 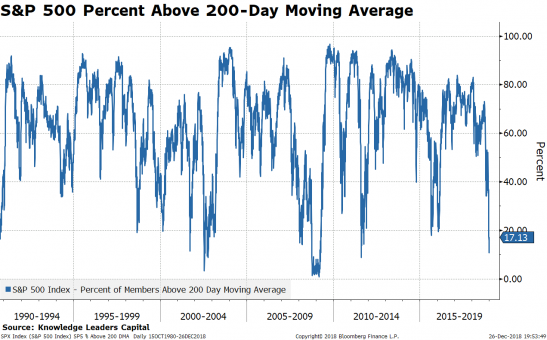 Looking at the percent of Nikkei 225 members trading above their 200-day moving average also reveals a more extreme oversold condition than the S&P 500. Only 7.56% of Nikkei 225 stocks are above their 200-day moving average, readings only seen in 2001, 2002, 2008-2009 and 2016. The recent volatility spike in Japanese stocks has been more muted than other oversold episodes, but the Nikkei volatility did spike to 32% a couple days ago. 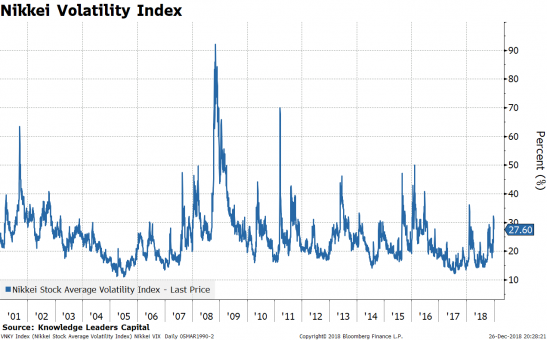 The lower volatility readings may be a result of cheaper valuations that suggest fewer excesses that need to be wrung out. 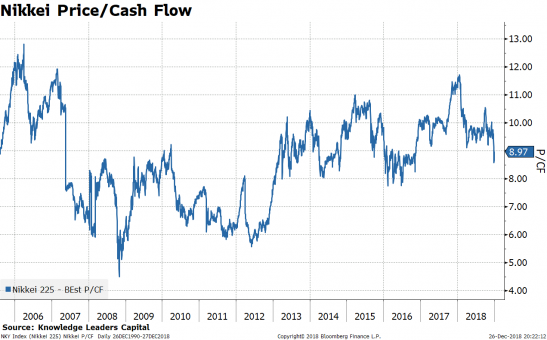 As described earlier, the S&P 500 has seen its price/cash flow ratio fall from 14x to 11x this year as stocks corrected. The Nikkei 225 has seen its price/cash flow multiple compress from just under 12x earlier this year to just under 9x currently. So, the Nikkei’s price/cash flow multiple is about 20% cheaper than the S&P 500. Due to the more extreme oversold readings and cheaper valuations, we have a preference for Japanese shares over US. Across the pond, European stocks have generated a set of oversold readings as well. The EuroStoxx 50 Index touched 35% recently, on par with extreme readings seen in the last several decades. 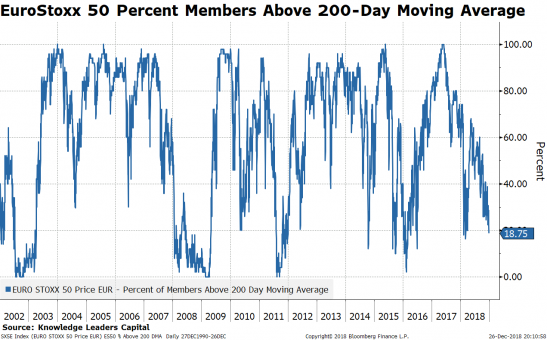 The percent of EuroStoxx 50 stocks trading under their 200-day moving average is currently 18.75%, under our 20% line indicating an oversold condition. Readings under 20% were experienced in 2002-2003, 2008-2009, 2011, 2014, 2015, 2016 and 2018. The EuroStoxx 50 has been more resilient than either the US or Japan when looking at the percent of stocks making new 52-week lows. While we recently hit 30%, this is a far cry from the 40%+ readings experienced in 2002, 2008, 2011, 2014, 2015 and 2016. This may simply be a result of index composition, where the EuroStoxx 50 is an index of only 50 large, high-quality companies. Similar to the Nikkei 225, the EuroStoxx 50 hasn’t experienced as big a surge in volatility as the S&P 500. Also similar to the Nikkei 225, this may be due to a lower valuation level suggesting less excesses that need to be corrected. 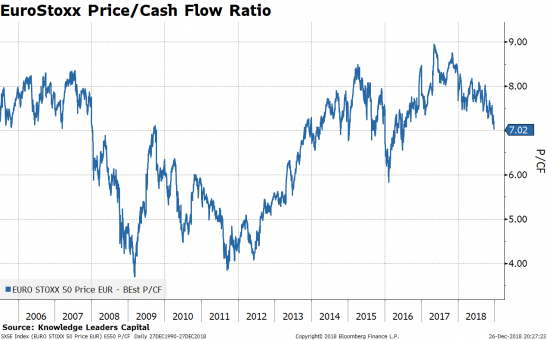 The EuroStoxx 50 has seen its price/cash flow ratio fall from just under 9x earlier in the year to about 7x currently. While this is not as a large a compression as the S&P 500 experienced, the level is about 30% cheaper than the S&P 500. All major global equity markets recently experienced a waterfall decline leading to a measurable oversold condition we haven’t seen since January 2016, almost three years ago. These oversold conditions are scary while they are happening, but for investors prepared, they can represent fantastic entry points.